Every year during the holiday season, the Grand Rapids Press reaches out to the community for help in meeting local resident needs. Since its inception, Studio 2 Dental has proudly given smiles back to its neighbors throughout the region. In concert with the National Foundation of Dentistry for the Handicapped and area dentists, Studio 2 Dental works to provide dental prosthetics to the disabled. 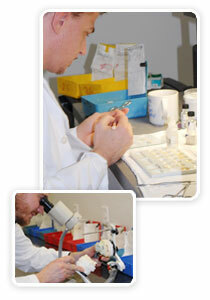 We coordinate treatment plans and donate all of our time and materials. This community program serves uninsured adults and provides low-cost dental restorations and other dental care. 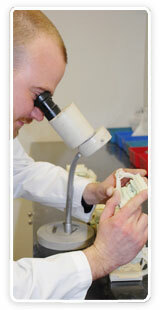 Studio 2 Dental works with area dentists to develop treatment plans and at-cost restorations. The program is a result of a collaborative relationship between Kent Health Plan, Cherry Street Health Services, United Way and West Michigan District Dental Association. Here is the article that was featured in the latest edition of LMT magazine, it highlights the West Michigan Dental Lab Association’s annual Golf Outing. This year Studio 2 was happy to host and raise over $1000 for a local charity. We had an amazing turnout from the dental community as well as friends and family. We couldn’t do it without our wonderful sponsors that included Cathy Olgesbee with Patterson Dental Supply, Don Mappin with Atlantic Precious Metals, Marvin Schmidt at Talladium, Allison Clay and Tony Houle with Ivoclar Vivadent, Lori Bauer at Nobel Biocare, Bob McElliot with Dentsply/Ceramco, Jamie Lynn Schooley-Quast at Astra Tech, Steve Miller at Huntington Bank, and Eric with Cagenix.We are looking forward to next year! Our tentative date is Wednesday August 15, 2010. 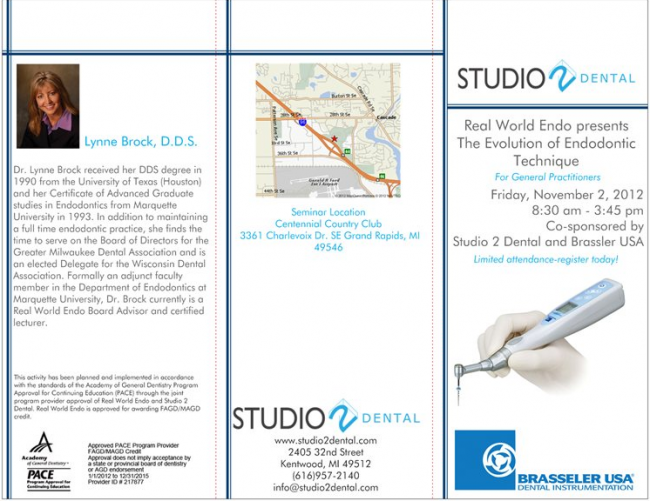 Join us Friday November 2, 2012 for a hands on seminar. 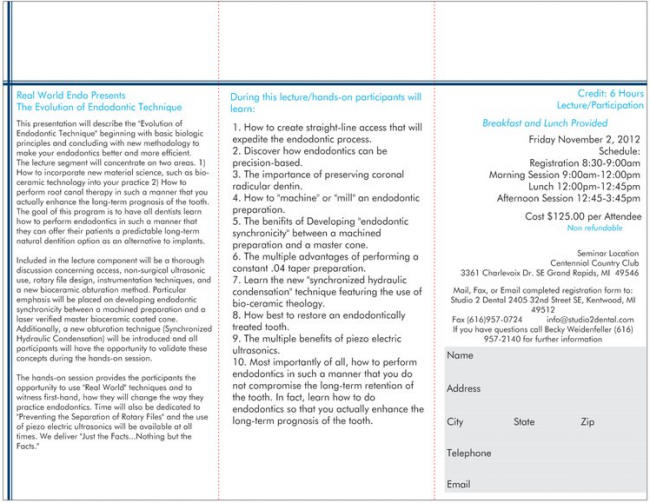 Earn 6 continuing education credits while learning the evolution of endodontic technique’s. The event will take place at Centennial Country Club in Grand Rapids, MI. Call Becky Weidenfeller at (616)957-2140 to sign up today. The New Dentist Forum is a great way to socialize and network with your peers. This is a casual educational meeting where we meet for dinner and a short discussion. Studio 2 Dental will be hosting this meeting at Noto’s Old World Italian Dinning on 28th Street. This event is free of charge and you will receive 1 CE credit for attending. 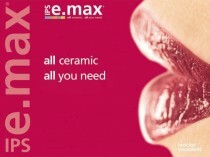 It is open to dentists who are 40 and younger or who have graduated within the last 10 years. Be sure to bring a friend as we are always looking for new members. If you have any questions or ideas for topics or speaker or if you are interested in becoming more involved please feel free to call Dr. Matthew Lieto at (616)451-2336 or lietomd@gmail.com. Studio 2 Dental will be co-sponsoring and event with Straumann, in association with Dr. James Papp, on dental implant complication and providing treatments that fit your practice. The speaker will be Dr. Mark D Zahn, a Periodontist and Restorative Dentist from Ann Arbor. This program is geared toward the general dentist. Topics discussed will aid in identifying and addressing implant complications and determining treatment solutions and how to avoid them through prevention methodologies. The event will take place Thursday, October 3, 2013 at Watermark Country Club at 6:00 PM. Hope to see you there! Click here for more details and sign up information.